28/02/2014 Even though your brain weighs only 1400 grams, it accounts for about 20 percent of your daily calorie intake. Your brain needs glucose - or blood sugar - for fuel, but requires very specific levels to function correctly. An adequate and steady calorie intake is the first step in any brain diet, with brain cells needing blood sugar to fire up and send messages. While glucose is necessary for brain function, however, too much blood sugar can have a negative effect on your brain. According to Alzheimer's Australia, diabetes increases Alzheimer's risk by 65 percent because the body can't control levels of glucose needed by the brain. Even in people edging towards diabetes, rising blood glucose has shown links to cognitive decline and brain shrinkage. According to Professor Perminder Sachdev, Co-director of the Centre for Healthy Brain Ageing at the University of NSW which runs the study, "Knowing that poor control of glucose can harm the brain means that doing all we can to keep glucose levels healthy with the right food and exercise gives us a better chance of avoiding dementia." 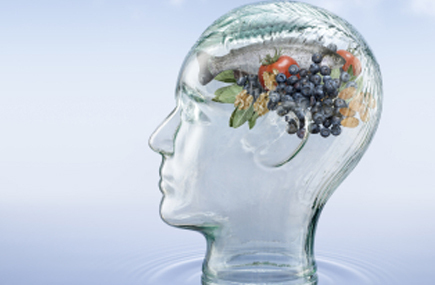 While claims of miracle brain food can sometimes be over the top, you can improve your chances of maintaining a healthy brain by adding certain foods to your diet. For example, wholegrains can assist brain function by slowly releasing glucose into the bloodstream, and coconut oil has been shown to alleviate and/or regress cognitive deficits associated with aging and neurodegenerative diseases. Oily fish products are also well known for their links to brain function, because they contain the most effective omega-3 fats needed to build and maintain myelin - a fatty substance needed to send messages between brain cells. Other than fish, other foods with these necessary fats include linseed oil, soya bean oil, pumpkin seeds, walnut oil, and soya beans. According to a study by Tufts University produced in the Journal of Neuroscience, increased consumption of blueberries has been shown to improve or delay memory loss. Tomatoes may also be a powerful brain ally, mostly due to their concentration of lycopene, an antioxidant which protects against the kind of free radical damage that occurs in dementia. Certain foods have also been linked specifically to memory function, with the messenger acetycholine shown to keep brain cells excited, improve new brain connections, and enhance memory. Drugs which mimic the effect of acetycholine have been found to boost memory in people with Alzheimer's, with this key chemical also made from choline, which is found in eggs, liver, and soybeans. Broccoli, cabbage, and other vegetables are also known to enhance cognitive function, thanks to a high concentration of vitamin K along with other vitamins, minerals, and essential nutrients. Avocados, red wine, coffee, and even chocolate have also been linked with mental health in different ways, so looking after your brain and enjoying your diet really can be the same thing.